Dodgers trade Howie Kendrick to Philadelphia Phillies. Howie Kendrick was an unsung hero for much of 2016, calling left field his primary position in a season where Andre Ethier, Trayce Thompson and Scott Van Slyke missed most of the year with injuries. Now, Kendrick is gone. The Dodgers traded him to the Philadelphia Phillies for outfielder/first baseman Darin Ruf and minor league infielder Darnell Sweeney on Friday. Kendrick, 33, batted a career-low .255 in 146 games for the Dodgers, who also played him at second base, first base and third base at times. But he saw fewer plate appearances per game in 2016 compared to any of his 11 major league seasons. Kendrick was reportedly so upset about his diminished playing time that he requested a trade. Ruf, 30, has done most of his damage against left-handed pitchers, posting a .299/.379/.542 career slashline over parts of five major league seasons. He’s appeared in 139 games (92 starts) at first base, one game at third base, 76 games (64 starts) at left field and 29 games (27 starts) at right field. 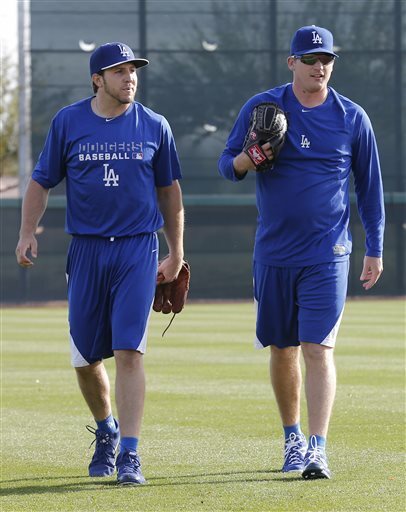 Sweeney, 25, advanced to the Triple-A level in the Dodgers’ organization before he was traded to Philadelphia for Chase Utley in 2015. He spent all of this year with the Phillies’ Triple-A affiliate, batting .233. Since Sweeney wasn’t on the Phillies’ 40-man roster, the Dodgers still carry 37 men on theirs. The Dodgers also gained some financial wiggle room: Philadelphia will pick up the final year of Kendrick’s two-year contract, which pays him $10 million next season. Dodgers acquire Chase Utley from Philadelphia Phillies for two minor leaguers. How would you grade the trade for Chase Utley? OAKLAND — The Dodgers officially acquired second baseman Chase Utley from the Philadelphia Phillies on Wednesday night, sending Triple-A utilityman Darnell Sweeney and Single-A pitcher John Richy in the two-for-one swap. I remember the time when the Dodgers sent out Trent Oeltjen a couple years back and Don Mattingly, then in his second year as manager, predicted Oeltjen could be a fourth outfielder somewhere in the major leagues. Maybe that wasn’t factually incorrect. Still, no team ever gave Oeltjen that chance. He spent a year in the minors, went back to his native Australia for a while, then retired. Corey Seager tops list of top 10 Dodgers prospects (DodgersDigest.com). This might be the end of prospect ranking season. At the very least, we’re close.